The major part of Natural Trap equid fossils may be referred to A. pseudaltidens. There are few cranial remains but more than 800 limb bones. In addition, there are a few specimens larger or smaller than usual but with the same proportions; I suppose that they come from different levels. A well preserved mandible KU 85033 (500NW515) lacks cups on the lower incisors like the type of A. pseudaltidens from Powers ranch (Fig.1, 2). The lower series 41592 could belong to the same species (Fig.2bis). The inferior molars are also similar to those of Powers ranch and to a specimen from Dry Cave, New Mexico (Fig.3). 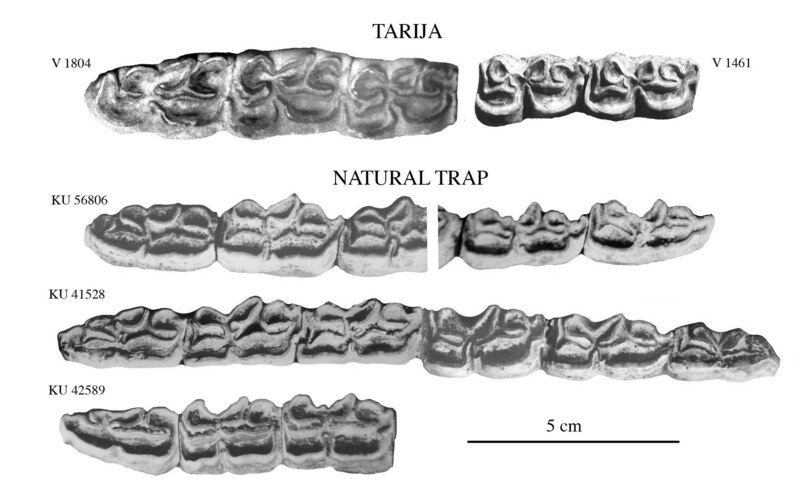 They resemble also the specimens I referred to the large Amerhippus Fig.3 Lower Cheek teeth, Natural Trap and Tarija but they are smaller. Unfortunately I have no data on the upper cheek teeth. Humeri and Radii give a good example of similarly proportioned bones with different sizes (Fig.4, 5). MC are deep in the diaphysis and in the proximal end like the type of A. pseudaltidens (Fig.6). There are also five specimens more slender (Fig.7); are they subadults? Tibiae proportions resemble those of A. pseudaltidens from Powers ranch. Two very large specimens are not very different in shape from the mean of this group (Fig.8). Most Natural Trap tali are bigger than in extant E. hemionus onager. Two specimens appeared to have abnormally small distal depth and one - an abnormally wide distal breadth; I decided to correct these probable errors of measure. Four are very large (Fig.9). Most calcanea are bigger than E. h. onager and smaller than A. leoni (Fig.10, 11). MT are deep in the diaphysis and in the proximal end like the type of A. pseudaltidens; two specimens are larger than the rest (Fig.12). Anterior and Posterior Ph1 are slenderer than in E. h. onager (Fig.13, 14). A few specimens are larger or smaller than the rest. Anterior and posterior Ph2 are not very different from E. h. onager. Some are larger or smaller than the rest (Fig.15, 16). Ph3 are about the same size that E. hemionus and E. kiang phalanges. The proportions of the limb bones segments are not very different from E. hemionus onager - the reference line (Fig.17). en Equidae monodactyles Equidés monodactyles fossiles (Equus, Allohippus, (...) Amérique du Nord, North America; Mexique, Mexico Natural Trap, Wyoming Natural Trap Amerhippus cf pseudaltidens ?